Last fall when we moved in, we really didn’t do a whole lot to the yard. Considering it was the end of the gardening season, we decided the best thing to do was wait till spring. Well, one non-existent winter later and here we are. Overgrown with dandelions. Last week Dave mowed the lawn for the first time this year. It looked fantastic. Before he mowed it, I didn’t notice the dandelions so much. Then about 4 days later…they just spread and completely took over in that short period of time. During the week we have been discussing what kind of method we want to use to rid ourselves of these things. The most obvious method, (herbicides) is totally out for us. Neither Dave nor I feel that using chemicals are a good idea on the lawn or in gardening. (Read about Environmental Effects of Pesticides ((ie, Herbicide, Insecticide)) here). This week I researched organic/alternative weeding methods. I read a few articles online about using pickling vinegar as spot treatment….clearly we have too many weeds for that. I went to some nurseries and asked about organic weed killer. Nothing. The last method…pulling them all out. Luckily for us, my parents have one of them handy dandy Fiskars Weed Pullers. I went out this morning and pulled for a good hour and a half, and got a little under 1/4 of the front yard done. *sigh* I have a feeling once I get a handle on the weeds, the lawn is going to look pretty holey. ;) The next step will be filling in holes and seeding. It sure would have been a lot nicer if the previous renters had taken a little bit of pride in the yard, instead of trashing it and leaving it to the weeds. I really don’t want to be a picky-pants about the lawn. 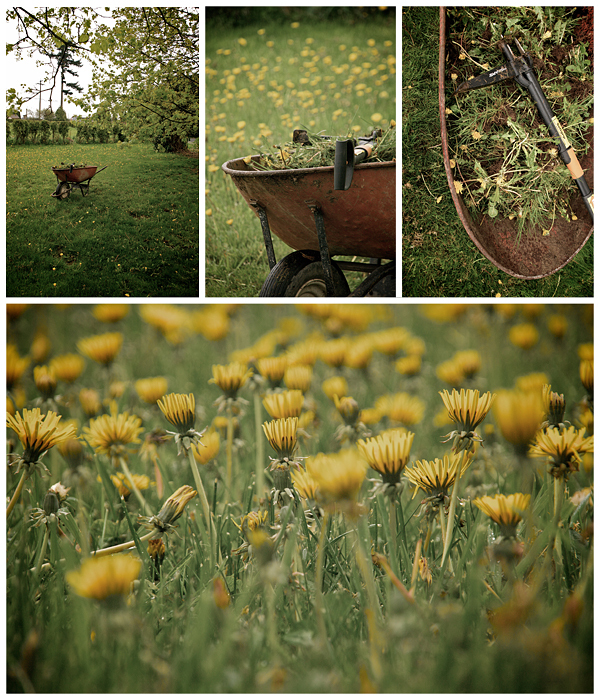 And truthfully, I actually don’t mind a few dandelions here and there. But seriously. This lawn is one big dandelion plant. It’s gonna be a busy next few weeks of yard work.